In rally on Utah’s Capitol Hill, groups oppose Rep. Chris Stewart’s call to create park and put monuments’ management in the hands of county commissioners. 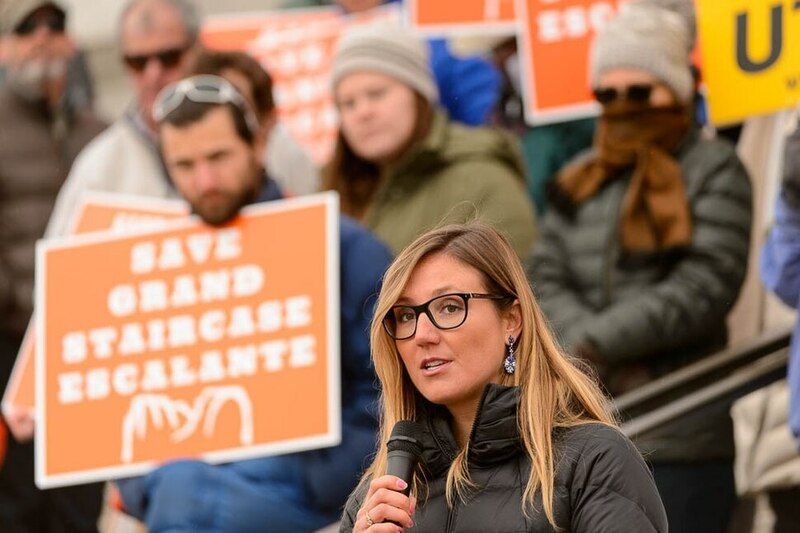 (Trent Nelson | The Salt Lake Tribune) Ashley Soltysiak, Director of the Utah Sierra Club, speaks out against Rep. Chris Stewart's Grand Staircase bill that would create an Escalante National Park during a rally on the steps of the State Capitol Building in Salt Lake City, Tuesday December 12, 2017. (Trent Nelson | The Salt Lake Tribune) Ashley Soltysiak, Director of the Utah Sierra Club, speaks out against Rep. Chris Stewart's Grand Staircase bill that would create an Escalante National Park during a rally on the steps of the State Capitol Building in Salt Lake City, Tuesday December 12, 2017. (Trent Nelson | The Salt Lake Tribune) Citizens with signs at a rally on the steps of the State Capitol Building in Salt Lake City against Rep. Chris Stewart's Grand Staircase bill that would create an Escalante National Park. Tuesday December 12, 2017. (Trent Nelson | The Salt Lake Tribune) Scott Berry, co-owner of the Boulder Mountain Lodge, speaks out against Rep. Chris Stewart's Grand Staircase bill that would create an Escalante National Park during a rally on the steps of the State Capitol Building in Salt Lake City, Tuesday December 12, 2017. (Trent Nelson | The Salt Lake Tribune) David Nimkin, Senior Regional Director, Southwest Region, National Parks Conservation Association, speaks out against Rep. Chris Stewart's Grand Staircase bill that would create an Escalante National Park during a rally on the steps of the State Capitol Building in Salt Lake City, Tuesday December 12, 2017. (Trent Nelson | The Salt Lake Tribune) Scott Berry, co-owner of the Boulder Mountain Lodge, speaks out against Rep. Chris Stewart's Grand Staircase bill that would create an Escalante National Park during a rally on the steps of the State Capitol Building in Salt Lake City, Tuesday December 12, 2017. (Trent Nelson | The Salt Lake Tribune) Stephen Bloch, Legal Director for the Southern Utah Wilderness Alliance, speaks out against Rep. Chris Stewart's Grand Staircase bill that would create an Escalante National Park during a rally on the steps of the State Capitol Building in Salt Lake City, Tuesday December 12, 2017. 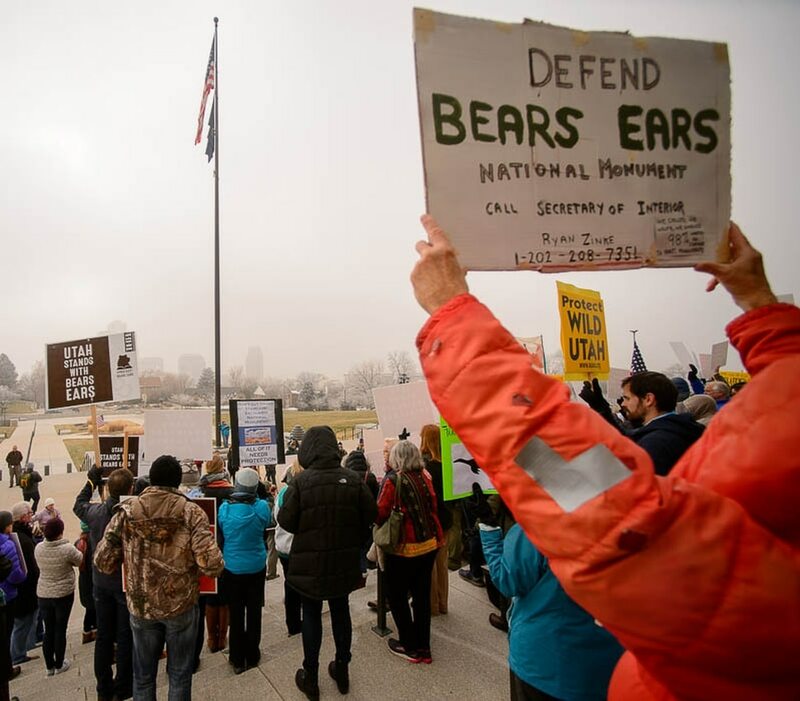 (Trent Nelson | The Salt Lake Tribune) Citizens with signs at a rally on the steps of the State Capitol Building in Salt Lake City against Rep. Chris Stewart's Grand Staircase bill that would create an Escalante National Park. Tuesday December 12, 2017. (Trent Nelson | The Salt Lake Tribune) Citizens with signs at a rally on the steps of the State Capitol Building in Salt Lake City against Rep. Chris Stewart's Grand Staircase bill that would create an Escalante National Park. Tuesday December 12, 2017. (Trent Nelson | The Salt Lake Tribune) Citizens with signs at a rally on the steps of the State Capitol Building in Salt Lake City against Rep. Chris Stewart's Grand Staircase bill that would create an Escalante National Park. Tuesday December 12, 2017. (Trent Nelson | The Salt Lake Tribune) Citizens with signs at a rally on the steps of the State Capitol Building in Salt Lake City against Rep. Chris Stewart's Grand Staircase bill that would create an Escalante National Park. Tuesday December 12, 2017. (Trent Nelson | The Salt Lake Tribune) Citizens with signs at a rally on the steps of the State Capitol Building in Salt Lake City against Rep. Chris Stewart's Grand Staircase bill that would create an Escalante National Park. Tuesday December 12, 2017. Conservationists often like national park proposals, but they are smelling a Trojan Horse in the latest idea from Utah’s Rep. Chris Stewart to create a sixth park in the state, covering the Escalante Canyons. 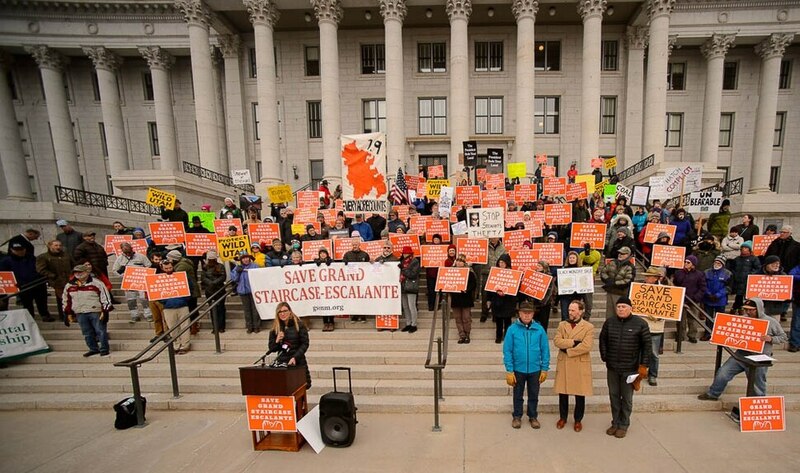 At a rally Tuesday in front of Utah’s Capitol, speakers claimed that Stewart’s bill to establish a 100,000-acre park in Garfield County is laden with so many toxic provisions that several environmental groups, local business owners, the National Parks Conservation Association (NPCA) and other groups want none of it. Among the chief defects of Stewart’s “Grand Staircase Escalante Enhancement Act,” they said, is that it seeks to write into law President Donald Trump’s recent proclamation slicing the former national monument by half — and puts Kane and Garfield county commissioners in charge of what’s left. “To suggest that creating a national park out of what is an extraordinary protected landscape for the purpose of drawing more tourists is insane,” said NPCA Southwest regional director David Nimkin. A spokeswoman for Stewart said the Republican lawmaker was baffled that environmentalists would be lining up against his park proposal and sought to turn the groups’ criticism against them. “I’m not familiar with the term ‘fake National Park’. But I can assure you, there is nothing fake about my proposal,” Stewart said, through his spokeswoman. On Dec. 4, Trump signed proclamations chopping Grand Staircase-Esclante National Monument into three—now known as Grand Staircase, Kaiparowits and Escalante Canyons national monuments—and Bears Ears National Monument into two small ones. Stewart’s bill aims to establish the national park and preserve within the 243,241-acre Escalante National Monument, an area outside Boulder marked by sinuous slot canyons and sandstone plateaus. His legislation would also ensure that hunting and grazing are among uses of the land “to be protected, conserved and enhanced” inside the monuments. The bill would create a seven-member “management council,” dominated by local elected officials, that would craft management plans for these four reserves. Two council members would come from the Garfield County Commission; two from the Kane County Commission; one from the ranks of lawmakers representing the area; and one from the Department of Interior. The remaining spot would be filled by the president. Critics of that approach say that while local management control may sound good, it puts parochial interests ahead of the larger public interest in preserving special landscapes owned by all Americans. According to Nimkin, with the NPCA, before Trump carved up the former Grand Staircase monument, it was “the connective fiber in the most remarkable part of this state and indeed the world,” shielding three of Utah’s 13 national park units, Bryce Canyon, Capitol Reef and Glen Canyon. Stewart’s plan amounts to “subtraction by addition,” Nimkin said, because it would enable industrial development on the 900,000 acres now excluded from the monument and put county commissioners in charge of the rest. According to Scott Berry, co-owner of Boulder Mountain Lodge just outside the proposed national park, Stewart’s office failed to consult with locals before releasing his proposal. “We don’t want a fake national park in the Escalante,” he said.